Hellebore varieties are numerous and include a range of colors and even double petals. This pretty little flower is a great choice for many gardens, not just for the many varieties, but also because it blooms when most other flowers are done or have yet to start for the year. For an extended blooming season in your garden, choose one or more of these types of hellebores. These perennial flowers are hardy to zone 4, so they can grow in many different gardens. They produce flowers early in spring and have evergreen foliage, so hellebore adds color and texture year round. 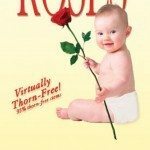 In milder climates, they may even produce flowers as early as January. Deer resistant and untroubled by many other pests, these flowers are also easy to grow. They prefer rich soil, partial shade, and only some watering during summer and dry conditions. 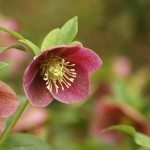 The most difficult thing you’ll find with growing hellebore is choosing the variety. Corsican hellebore. This variety does not produce the largest or most dramatic hellebore flowers, but it does grow vigorously and creates lush foliage. The flowers are small and pale green. Ivory prince. 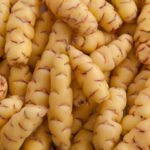 This pretty variety produces an abundance of ivory colored flowers that also have chartreuse and blush veining in the petals. 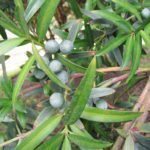 The foliage is blue-green and the plant is compact in size and density. Winter Jewels. This is a series of hellebore varieties designed to produce large blooms in a range of colors. These are also known as Lenten rose. There is Cherry Blossom, white and pink flowers with red centers; Golden Sunrise, which is yellow; Apricot Blush with apricot tinged, white petals; and the stunning Black Diamond. The latter produces purple foliage that turns green and dark burgundy blooms that are nearly black. Fragrant hellebore. For aroma as well as visual interest, choose the fragrant hellebore. The flowers are large and a vivid lime-green to yellow in color. They produce a fragrance that can vary from sweet to a little bit skunky. Picotee Lady. This variety of hellebore develops green-white flowers with pink veining and dark red around the edge of each petal. Double Ladies. The double ladies are hellebore plants that produce double-petal blooms. They come in several shades, including red, pink, white, yellow, and purple. 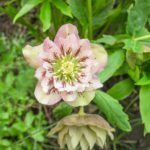 With so many hellebore varieties to choose from, not to mention the qualities of being easy to grow and producing winter-to-spring blossoms, this particular perennial is a top choice for four-season gardeners.